The word of the night was meaning. On August 23, Jod Kaftan from BLITZ Agency talked to the Los Angeles web design community at large about how to give meaning to a user experience. “The device should not prescribe what the experience should be,” Kaftan said. Throughout the night he discussed four main points which all related to the idea that interaction design should have meaning when implemented onto a device. “Really what this exploration is about is thinking of the device last,” he said. “For me, meaning in terms of interaction design is about resonance,” Kaftan said, “meaning should serve as a beacon for interaction designers to push us into new, interaction paradigms.” Next he mentioned that he has only scratched the surface with contemplating what meaning is and how it relates to design. 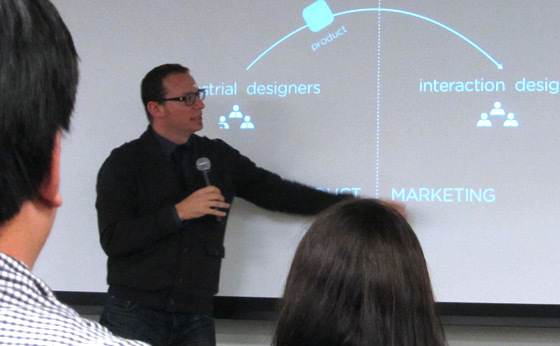 The LA web design community was then taken through the four dynamics of what connects interaction design to meaning. “Ultimately my point is about focusing on needs, threading them through meaning and creating culture with that,” Kaftan stated, “it’s about culture.” The message was brought home when he gave an example of the world renown iPod music device and how its cultural impact made consumers aware of their need to have an entire music collection in one place. For brands today it is harder to retain active loyalty from consumers because of competition, new technology and different ways people can now buy. It is imperative for a brand to maintain active loyalty. “We have to serve people more meaningfully; we have to go further,” Kaftan said. To support this idea; he gave an example of when he once had to return a television to Amazon. It’s excellent customer service made his experience with Amazon a meaningful one. “Wow, okay, I’m never not ordering a tv from Amazon,” Kaftan concluded the story. This portion of the night dealt with the differences between content and tasks. Which one is to be designed first? “Content first verse task first is really a question of emphasis,” he said. It is not a matter of ‘either’ ‘or’ because both must be considered in design. The goal is to pay attention to both and understand that they do not interfere with interaction designs. The lecture was followed by a question and answer session. The Los Angeles web design community and UX designers were pleased to learn about designing with meaning. The topics were intriguing and were supported by relevant, everyday examples. Many thanks to speaker Jod Kaftan and host LA-UX Meetup for an engaging and informative evening! Also, thanks to the sponsor Yahoo! for providing a great venue and refreshments. Jod Kaftan is the Experience Design Director at BLITZ Agency in Santa Monica, CA. Prior to BLITZ, Jod worked at The Los Angeles Times, Schematic, Razorfish, Citysearch and AOL. In addition to being the Design Director at BLITZ, he is also a writer. And, as a writer, Jod has been published in Rolling Stone, The Los Angeles Times, The New York Times, New York Magazine, This American Life and UX Booth. Jod can be found on Twitter at http://twitter.com/jodspeed.